Connect AND CO With WePay So You Can Get Paid Online straight to your WePay account. Please Note: WePay is for United States and Canadian Users only & you can only accept payments in your local currency eg. US to US or CAD to CAD with WePay. 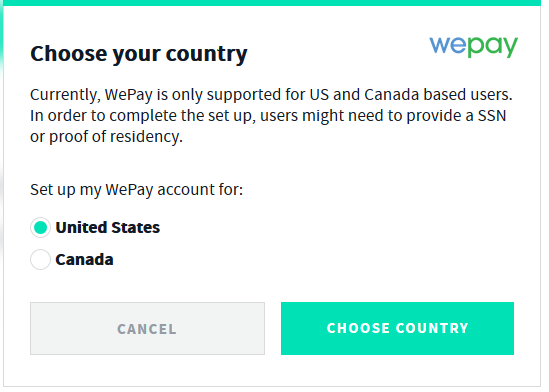 Once you have selected your country you will then see that you have now set up a WePay account and connected it to AND CO.
You will need to ensure you have Confirmed your email, Please check your email inbox. WePay will send you a confirmation link. 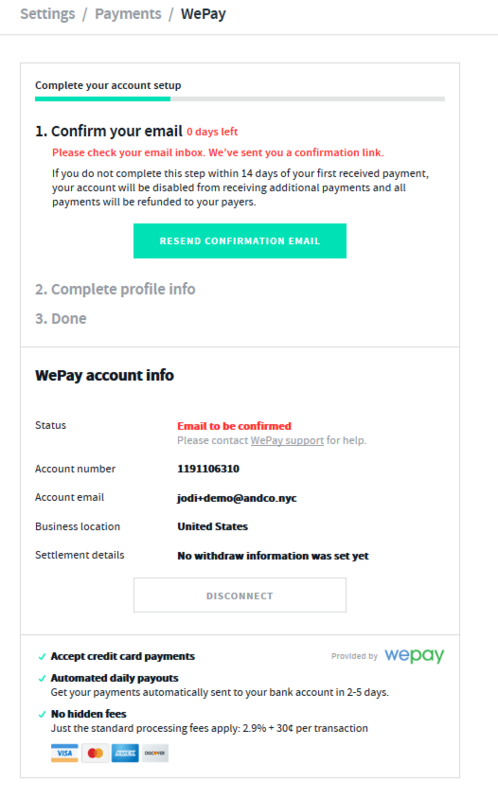 If you do not complete this step within 14 days of your first received payment, your WePay account will be disabled from receiving additional payments and all payments will be refunded to your payers. 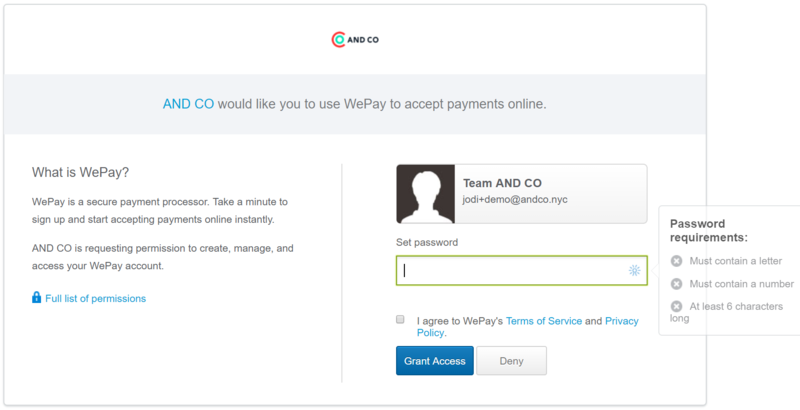 "Payments made to your AND CO account are powered by WePay. Please click below to verify your account. If you do not complete this step within 14 days of your first received payment, your account will be disabled from receiving additional payments and all payments will be refunded to your payers. Once you confirm your email, make sure you also log in and provide accurate identification information about yourself and your bank account. If you do not provide this information, WePay Payments will refund all payments to your payers 30 days after you accept your first payment." 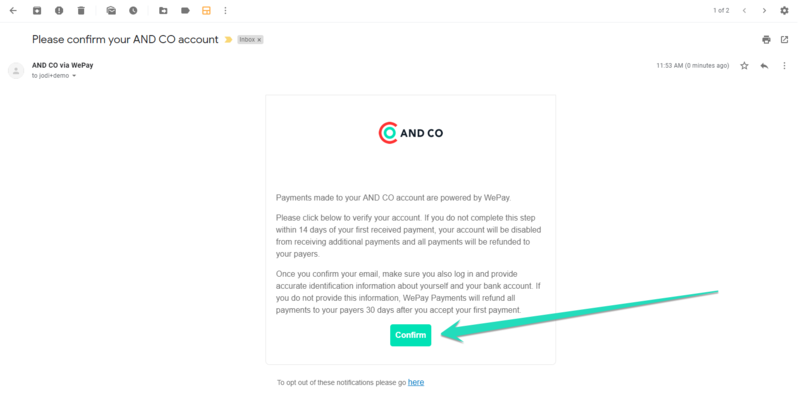 Once you have confirmed your email you will be prompted to set up a password for WePay and complete your WePay profile info including adding your bank details for all of your transfers/withdraws. To transfer funds from your Wepay account to your bank account, you need to complete your payment profile. Log in to WePay and provide accurate identification information about yourself and your bank account. 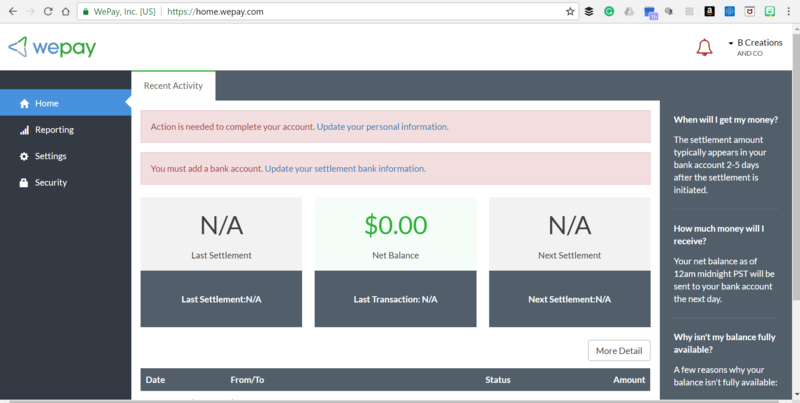 If you do not provide this information, Wepay will refund all payments to your payers 30 days after you accept your first payment. Select > Complete Profile Info and follow the prompts to complete your WePay profile and business set up. Change your business details if required and change your business to one of the options listed. Eg Business, Sole Proprietor, Individual, Non profit organisation. 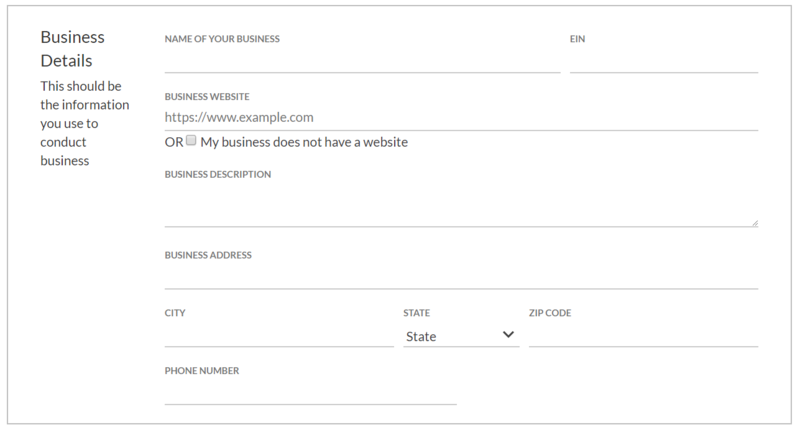 All fields on each form needs to be completed unless it explicitly says optional. Select Submit to continue to complete your profile set up and agree to WePay terms of Service. 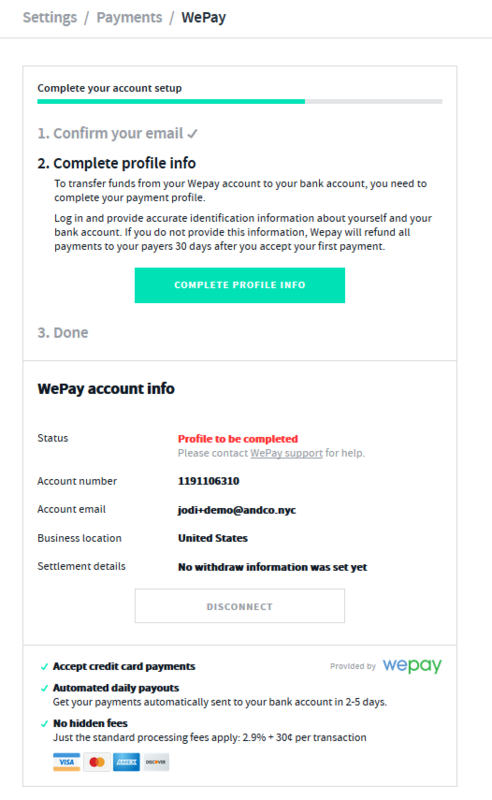 Once you have completed this information you can continue to log into WePay directly to complete your bank account settlement details and any other profile information directly in WePay. Once logged in you will any actionable notifications via your WePay dashboard. Please select these to then action them and complete your WePay set up. You will need to ensure your personal details are updated and correct before you can add your bank account details. You can manage and access any payments made directly to WePay via your WePay account as well as check on any pending/processed payments. Once you have selected TURN ON WEPAY your clients will be able to make payments to your WePay account even if you have not completed your profile set up for WePay. It is important that you complete your WePay profile so you can have any payments transferred to your nominated bank account. You can only accept payments in your AND CO and WePay currency eg. US to US or CAD to CAD. Please ensure you have added your Bank account details directly via Wepay so your payments once processed can be transferred to your nominated bank account.